I have a severe addiction to sock knitting. While I may not have a ton of socks in my closet, I have casted on approximately double the amount of socks that are there to show. Moreover, sock yarn never stays in my stash. 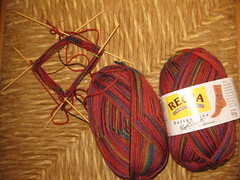 I will use my sock yarn quite soon after purchasing it. 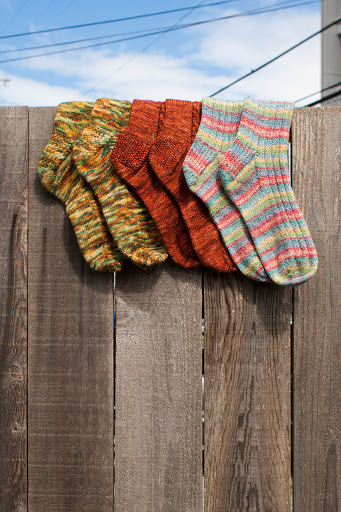 Isn’t the feel of superwash merino in sock weight just dandy? It’s always too tantalizing to keep. Do you have a favorite yarn weight/feel? Funny enough, these socks have been 4 other socks. Yup, that’s right 4 other socks. Well, technically not actually 4 other socks, but I’ve finished at least 1/2 of a pair (one) other sock with 4 other patterns? I’m sure none of that made any real grammatical sense, but I’m sure you readers know what I mean. I’ve frogged this yarn 4 times in the quest to finish them, and I’m pleased to present to you my Journey Socks. If anyone wants a pattern, I’ll gladly write one up, but for now, they’re simply the socks (yarn) that had been purchased in Seattle in 2010, traveled to Italy as one pair of socks, traveled in Europe as another pair of socks, to California as a different pair of socks, back to Seattle for the summer, and back to California as another pattern. And now, they’re a different pair completely. Isn’t knitting about the journey/process? (I’m definitely a process knitter) Isn’t life about the journey and the process? So despite my rather rigorous schedule with my last quarter of school, I was still determined to participate in the first L.A. County Yarn Crawl. Of course, I forgot to turn in my passport, but I did only make it into three stores (on the first day too, sadly). I had a deadline on the following Monday, leaving me with little time to venture throughout the city. But that didn’t mean that I didn’t score some great yarn (and exciting potential projects!). From left to right: Plymouth Happy Feet DK, Frog Tree Sock Yarn, Mountain Colors, and I forgot the last one. But there are sweater quantities of the last one, which is super exciting. I already know that the Frog Tree is going to be come simple ribbed socks, the Happy Feet are already on the needles (ribbed socks as well), and I’m thinking the Mountain Colors is going to be a cowl. But plans can change. Though I only got a taste of the event, I had such a lovely time. I really wish I could spend more time at LYSes and with knitters; they’re such a happy, cheerful bunch (though that might be a premature label). The morning I spent perusing yarn shops put me in such a great mood after countless days toiling in front of a computer in studio. I always enjoy a good trip to the yarn shop as I always get to learn new tricks and get to know miscellaneous people. I can’t wait to graduate and have more time to devote to knitting (and ultimate frisbee). …coming soon: a much needed Hawaii entry and a FO entry. And the finish line is 6 days away…Must finish the other one before I leave! …ready, set, GO! Time for some knitting sprints.